Thank you for the kind words yesterday, it's good to be back. In an effort to occasionally post more of my work here, I thought I'd start with this. 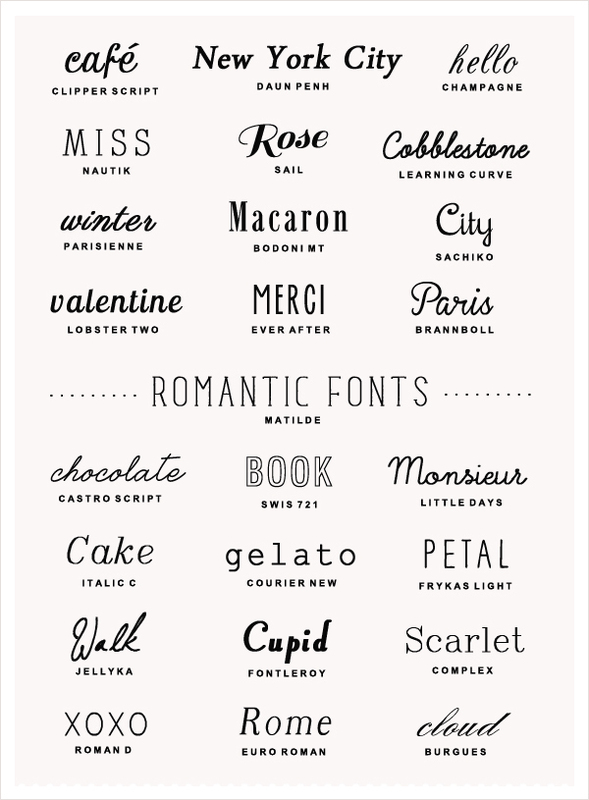 I got into the Valentine's spirit early this year, before we even took our sweet Christmas tree down (it basically shattered once we finally evicted it - so sad), and I put together this roundup of romantic-y fonts for A Subtle Revelry. Selecting the words - petal, or cloud - was probably my favorite part, although playing around with fonts is also my idea of fun. Have a lovely weekend! Graphic by Hooray. Sources for downloading or purchasing fonts listed here. I haven't really explored fonts much but I just love the Little Days one!! These are sooooo pretty!! And it is great to have you back :) We all need a break and time to reflect, enjoy your time in and out of the blog world, I'll be checking in from time to time at your lovely blog just because I enjoy it so much. ooh la la! so beautimus. ooooh love these, it makes all the difference to see them written out. Happy monday!